• Shared Impact & Philanthropy – Where he leads his team’s efforts to build deeper, more meaningful partnerships, and considers the mobility challenges for underserved communities by combining Toyota’s know-how, people and ideas with the work and of like-minded organizations and partners, to create positive social change. • Diversity and Inclusion – Ensuring Toyota North America’s internal and external stakeholders reflect the diversity of our society and our customer base and that we continuously work to cultivate inclusive and diverse practices in all aspects of our business. • Environmental Sustainability – Leading provisions and initiatives for protecting and enriching our environment: In our cars, our manufacturing process and plant operations, our buildings/facilities and our partnerships with our dealers and in the community. • Multicultural Business Alliance – Leading the strategic, relationship development with targeted demographic consumer groups in collaboration with TMNA Sales and Marketing, our Toyota and Lexus Dealers and Government Affairs to leverage our synergies to promote stronger relationships in the community and Toyota’s business in North America. • The Toyota USA Foundation – The leadership, management and administration of this $100 million charitable endowment started in 1987 that supports innovative programs for students and teachers in science, technology, engineering and math programs during all phases of education – from preschool through post-secondary education. Social Innovation is the integration of these functions with all Toyota’s assets, helping to bring sustainable, positive benefits to society, underserved communities and Toyota’s business in North America. Smith’s 28-year career at Toyota spans a variety of key leadership responsibilities in Sales, Service, Technology, Strategic Planning, Financial Services and Administration. 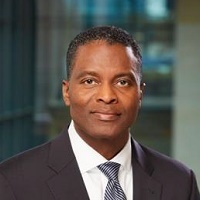 Most recently, Smith was Group Vice President of Service Operations and Corporate Planning for Toyota Financial Services (TFS) and Lexus Financial Services (LFS) having overall responsibility for TFS and LFS U.S. customer services and service operations for Toyota Financial Services/Lexus Financial Services, leading Customer Service, Collections, Asset Protection, Central Recovery and Fraud Departments. Smith also led this company’s Corporate Strategy Division. Smith is a member of the National Urban League Board of Trustees, the Congressional Black Caucus Foundation Board and the Executive Leadership Council. He has served as executive advisor for several of Toyota’s Business Partnering Groups. Smith also served as District Chair for the Boy Scouts of America’s Thunderbird District, as a board member of FFA Foundation, and the Conference Board Technology Council. Additionally, Smith is a member of Kappa Alpha Psi Fraternity Inc. and a member of the Los Angeles Council on World Affairs. Smith has a Bachelor’s of Business Administration, from California State University, Long Beach.